Bosch's inclusion of the Fall of Adam and Eve in a representation of the Last Judgment is unusual; the other two panels of the Vienna triptych depart even more from traditional iconography. Generally Heaven was allotted the chief role in the eschatological drama. As in the altarpiece by Roger van der Weyden, it is the act of judgment which is stressed; the judged are relegated to positions of secondary importance, and the felicity of the saved is described as fully as the pains of the lost. 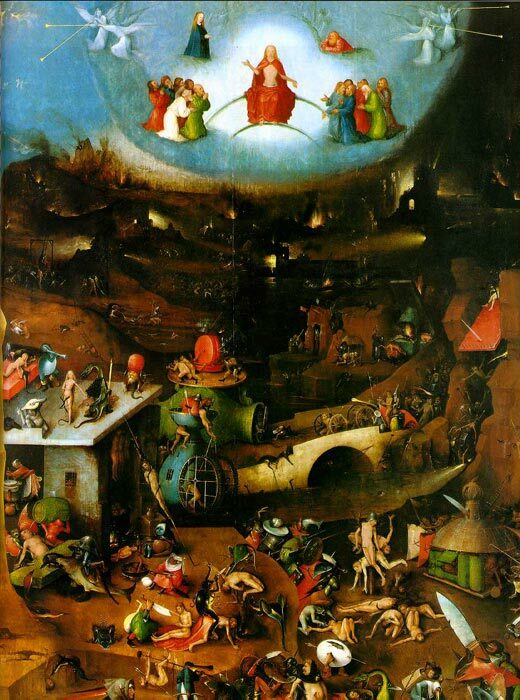 In Bosch's version, however, the divine court appears small and insignificant at the top of the central panel, and very few souls are numbered among the elect. The majority of mankind has been engulfed in the universal cataclysm which rages throughout the deep, murky landscape below. This vast panoramic nightmare , displayed by Bosch represents the earth in her final death throes, destroyed not by water as Dürer and Leonardo da Vinci were to envision it, but by the fire foretold in a thirteenth-century hymn, the sombre Dies Irae: "Day of Wrath, that day when the world dissolves in glowing ashes". Bosch was probably also influenced by the account of the last days given in the Revelation of St John, a book which enjoyed renewed popularity in the late fifteenth century, when it was illustrated by Dürer in his famous Apocalypse woodcuts of 1496-97. The wide valley dominating the central panel may represent the Valley of Jehoshaphat, which, on the basis of several Old Testament references (Joel 4:2,12), was traditionally thought to be the site of the Last Judgment, with the walls of the earthly Jerusalem blazing in the background. In any event, earth has become indistinguishable from Hell, depicted on the right wing, out of which the army of Satan swarms to attack the damned; the eternity of torment has begun. The Hell scene depicted by Bosch in the Prado Tabletop had paired off each punishment with one of the Deadly Sins. In the Last Judgment would be difficult to identify the punishments with specific sins. The avaricious are boiled in the great cauldron just visible beneath one of the buildings in the central panel. Around the corner, a fat glutton is forced to drink from a barrel held by two devils; the source of his dubious refreshment can be seen squatting in the window overhead. The lascivious woman on the roof above suffers the attentions of a lizard-like monster slithering across her loins, while being serenaded by two musical demons. On the cliffs to the right, across the river,Bosch depicts blacksmith-devils hammering other victims on anvils, and one is being shod like a horse; these unfortunate souls are guilty of the sin of anger. SPECIAL NOTE : The painter will make the reproduction as close to the original oil painting as possible. If you want your painting to alter from this likeness, please email us and " Last Judgement, central panel of the triptych " will be reproduced according to your special requirements.